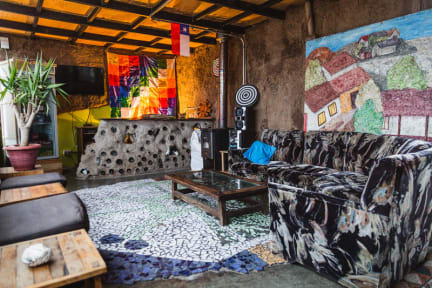 Aji Verde Hostel i La Serena, Chile : Boka nu! Since we understand travelling, we take our job very seriously. Therefore we have carefully prepared these two hostels together with 100% bilingual staff, artists and backpackers to provide you just what you need for an unforgettable stay. 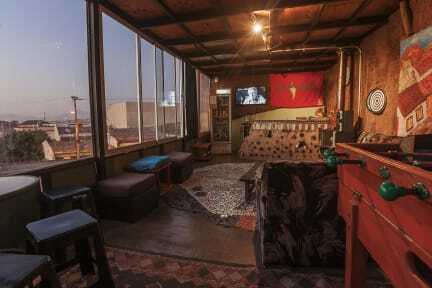 One of our hostels is situated in the central part of La Serena city. Our hostel is close to The Old Town, main square, Museums, Art Galleries, Banks, Arts & Crafts shops, Main Market, Flea Market, Fish Market, Bars & Restaurant and the public transport. The beach is 25 min away. The other one, Aji Verde Beach hostel, is in La Herradura beach, 200 meters off the sandstrip. Since the Fish market is 20 steps away from Aji Verde hostel, you can try different kinds of seafood here. We have a safe environment with the most cheerful staff who willingly help you with anything. We offer single and shared rooms along with common areas like kitchen, living/dining room and a terrace where you have an 360° view to the city. We provide also free Wifi, Playstation2, table football, darts, cable TV, playing cards etc. Sometimes we do together BBQs in the evening and share mate in the morning, play guitar and have good conversations. We can instruct you with activities like surfing, rock/mountain climbing, kayaking. We can even teach you some Spanish and how to play guitar!